Don Preston was born in 1939 in Toronto, Ontario, Canada and now resides at Sharon, Ontario, Canada. Don has been carving Fish Decoys for 30 years (began in1977). He still carves today in 2007. Don wrote that his father Walter Preston was an avid fisherman and in the winter hew would take him ice fishing to Lake Simeo, north of Toronto. Don was very young (about 10 years old) and his mother would bundle me up for the cold walk to the ice, but upon arriving, Don’s father would start the wood stove and chop a hole in the ice. 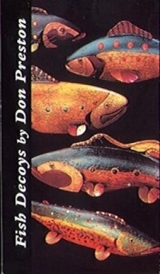 Don said that his father would let him work the fish decoy that he made when an unsuspecting fish would appear and Don went to say he would pull it up. Don started carving and painting fish decoys and giving them to friends. People liked them and started buying them as folk art and Don has been making them ever since. Like Don’s father he carves his decoys out of white pine and uses copper for the fins and attachments. Tacks or glass for the eyes, then he pours hot lead in 3 cavities for sinkability. He then hand paints them and marks them with D.P. Don finished his story to me with the fact that his father inspired him to carve fish decoys. Click here to read additional information on Don Preston. 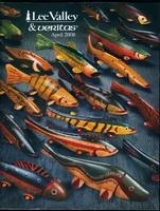 Don was again rewarded with a cover for Lee Valley April 2008 Catalog issue. Don carries on the tradition on helping new fish decoy carvers get started. Here is the first step he helped me by providing me with a partially finished fish decoy.